Equatorial Guinea’s President Obiang Nguema Mbasogo recently met with the Russian Ambassador in Equatorial Guinea, Nikolay Ratsi Borinskty to discuss cooperation in the technical, security and defense sectors. 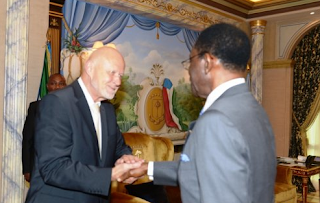 During the meeting, President Obiang and Ambassador Ratsi Borinskty talked about the willingness of both countries to promote and strengthen common bonds, and the importance of security in the Central African subregion. A few weeks ago, Equatorial Guinea’s Second Vice President for Defense and State Security, Teodoro Nguema Obiang Mangue, met with Chinese Vice President Li Yuanchao to discuss strengthening mutually beneficial cooperation projects in such sectors as defense and security. During the meeting, Vice President Yuanchao announced China will donate 3.8 billion CFA Francs to fund cooperation and security projects in Equatorial Guinea.